I drew this up this afternoon because keeping track of all the tamers and elite pets was giving me a headache. Apologies for any text that may be hard to read (full-sized image link is below). Tamers are underlined and elite pets have their type designated in parentheses: (A) for Aquatic, (B) for Beast, (C) for Critter. 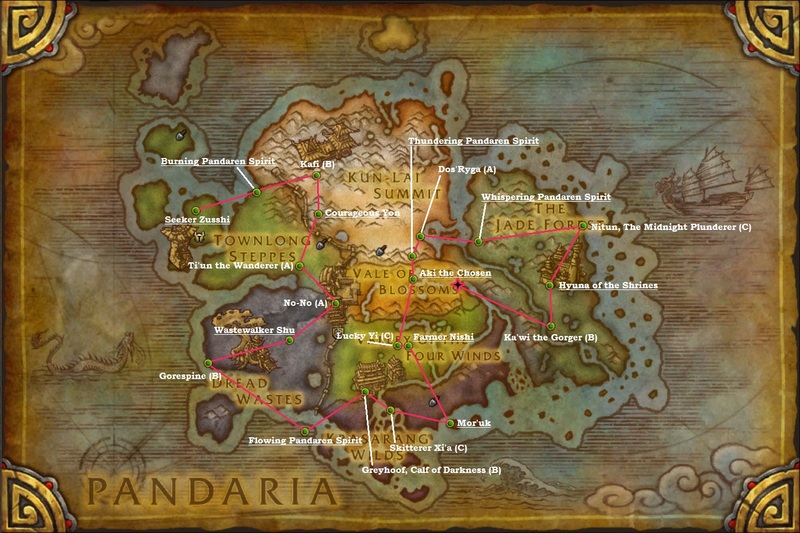 A suggested route between battles is highlighted in pink, and it assumes you're starting at either of the shrines in Vale of Eternal Blossoms (I mean c'mon, it's 2013, who DOESN'T have their hearth set there =D). Last edited by Iconyx on March 6th, 2013, 5:02 pm, edited 1 time in total. How long did this circuit take you, btw? Not that I'm likely to hit the old trainers until pet battle teams works again. I can't put an accurate time on this circuit, because my addon for saving trainer-specific rosters isn't working. I'd estimate - without any losses or retries - 90 minutes or so. Thanks so much!! This is a BIG help when doing the dailies. This is great. Thanks. Is there any way to make this show up on my game map? I was using HandyNotes but quit working and does not include the elite pets. Baldulf wrote: Iconyx = HERO. Too kind, thank you. This had already been drawn up by Enzzo at warpets.info over a month ago, which I did not know, but 'we' developed different routes. Bamboofarian wrote: This is great. Thanks. Is there any way to make this show up on my game map? I was using HandyNotes but quit working and does not include the elite pets. Sort of. If you download TomTom, a map addon, you can set a waypoint at each of the battle locations. Change the addon settings so that "Clear waypoint distance" is 0 yards and "Save new waypoints until I remove them" is checked. In this way, you'll always have green-and-yellow circles on your world and zone maps indicating where to go next. The Tom Tom add-on is pretty handy for this. I've been trying to figure out a THIRD route, alternate from Iconyx's and Enzzo's routes. I'm trying to come up with one where you start at the Shrine in the vale. Because you have to start in the Vale to pick up the daily quest for the Beasts anyway. But the way the pets are laid out, there's not a terribly efficient way to do it that way. Ugh. Blizzard, I swear, you want me to pull my hair out. So, not sure if this is what everyone is looking for exactly, but hopefully it will help a little. The addon Battle Pet Daily Tamer that tracks all your unfinished pet daily locations was updated to include the locations of the Elite pets (when the quest is active in your log). Quintessence wrote: So, not sure if this is what everyone is looking for exactly, but hopefully it will help a little. Will give a try and report back. Thanks for this. Seems to be exactly what I needed. EDIT: WOW! Really awesome. Cant thank you enough.